Since the May 2014 announcement of Husqvarna’s return to AMA Pro Racing, the newly formed Rockstar Energy Racing Husqvarna Factory Team has been busy assimilating a full roster of riders to compete in the upcoming 2015 AMA Supercross and Pro Motocross Championships. Husqvarna is now proud to announce that Martin Davalos, Zach Bell and Zach Osborne have joined reigning 250 West Supercross Champion Jason Anderson on the Rockstar Energy Racing Husqvarna Factory Team. Since the start of its new generation, Husqvarna Motorcycles has celebrated success in many major national championships, but the brand’s return to AMA Supercross and Pro Motocross remains a major initiative of the company worldwide. Husqvarna’s return to the height of pro racing, and the formation of the new team is also a momentous occasion for the crew at Rockstar Energy, as title sponsors of Husqvarna’s factory Supercross and Pro Motocross efforts. 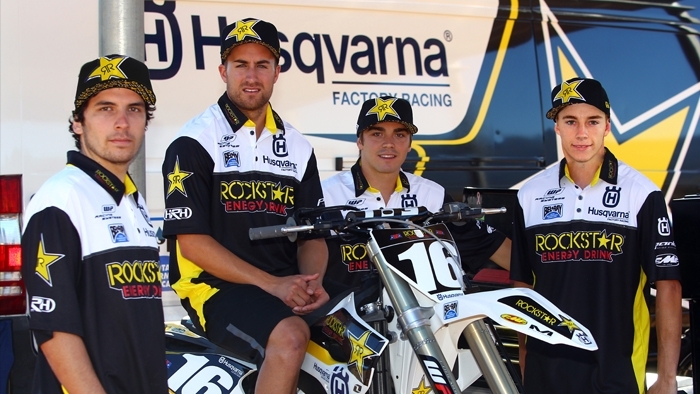 Dave Gowland and Bobby Hewitt of the Rockstar Energy Racing Husqvarna Factory Team constructed the roster of racers that will represent Husky in 2015. They are both eagerly anticipating the upcoming season, and share in the historic sentiment of Husqvarna’s return to AMA Pro Racing. Jason Anderson #17 | 250 West Supercross Champion! With a stellar 2014 season under his belt, New Mexico native Jason Anderson is looking forward to making the move to the premier 450 class in 2015. Anderson will be contesting the AMA Supercross Championship and the AMA Pro Motocross Championship aboard an FC 450. Look for some fireworks from number 17 in 2015! Zach Osborne has spent much of his Pro career competing overseas, with a British National Championship and 14 World Motocross GP podiums to his credit. Osborne is no stranger to the AMA Pro Racing ranks, and is looking forward to making a concerted effort in 2015, where he will be riding an FC 250 in Supercross and Motocross. Osborne will also be once again representing the U.S. in the ISDE, and will contest the upcoming 2014 Six Days aboard a Husqvarna. Davalos will be racing the AMA Supercross season in the 250 class, and will make the step up to the premier class in the outdoors, racing an FC 450 in the premier class of the AMA Pro Motocross Championship. Young up-and-comer Zach Bell is the final member of the four-man Rockstar Energy Racing Husqvarna Factory Team. After an amazingly successful amateur career, having captured 89 amateur motocross titles, the 19-year-old is entering into his third year as a Pro. Bell and is looking forward to taking on the 250 ranks in both Supercross and Motocross.